Roman shades give a glamorous look to your home; if you want to create some color and life in your interior you can opt for Roman shades for your home. Roman shades are very popular and they are liked by many people. If you are planning to get roman blinds for your windows then you must get some information about these blinds before buying them as there are different kinds of roman blinds and you can select the type according to your requirement. Folding shades: this is a traditional style in shades; it gives a classic and traditional look to your home; it contains evenly spaced overlapping folds that make it simpler to use. Balloon Roman shades: this type of shade gives a formal look to the room; usually they look nice in dining and formal living room; you must have seen such type of shades in hotels and restaurants. These types of shades contain box pleats at the top followed by a series of balloon shaped folding towards the bottom. Room darkening roman shades: these shades are ideal for the people who like to enjoy dark and cool atmosphere. 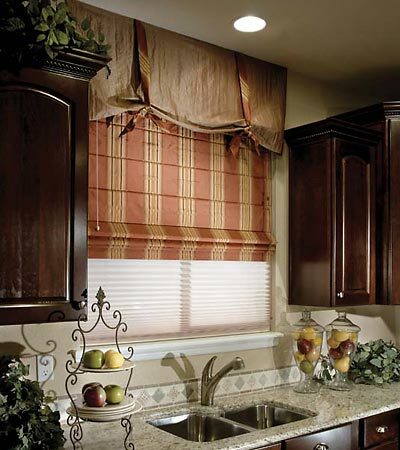 These Roman shades block the sunlight and create a dark and soothing environment in the room. If you want to keep your room from harmful sunrays and enjoy a cool and calm atmosphere then you can opt for this style. Light filtering shades: if you like to have sunlight coming in the room but in a little amount then these shades are ideal for you. You can get a satisfactory amount of sunlight in your room that gives a fresh and scooting effect to your room as they do not block the entire amount of sunlight but provide a small amount of filtered sunlight in the room. This entry was posted on June 29, 2011 at 12:44 pm	and is filed under Uncategorized. You can follow any responses to this entry through the RSS 2.0 feed. You can leave a response, or trackback from your own site.